Home Stuff #AllAccess – 30 hours for a good cause! I just finished my first Hackathon and am still quite excited about the weekend. It’s incredible what 120 people can come up with when they are voluntarily locked in a room (not literally), to tackle problems which are faced by hundred thousands of people! 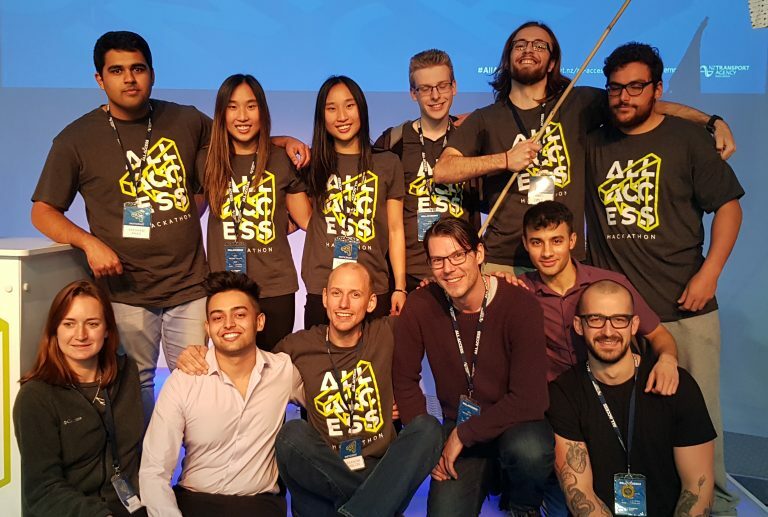 Below is a summary of my weekend, the solution our team came up with and a few tips if you ever attend a Hackathon. 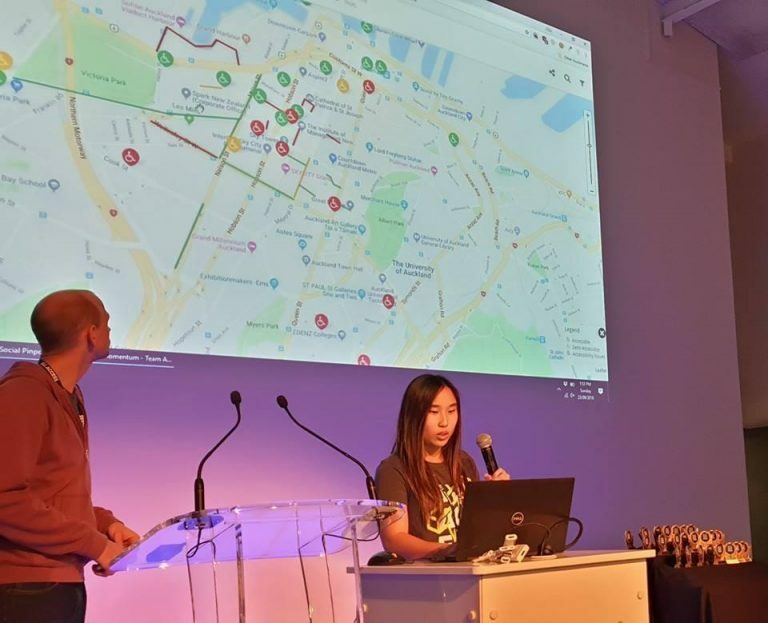 NZTA, the New Zealand Transport Agency started doing Hackathons to address general problems they face and to get the community involved to come up with ideas on how to solve those problems. The first one around 6 months ago was about road safety and how to reduce deaths on NZ roads, this one “All Access” was about accessibility to transport options, for people with disabilities, in remote areas or with limited financial means. Our project was a web app which allows users to report accessibility problems in public places. Existing solutions focus heavily on accessibility of buildings, while the actual path towards the building is often forgotten. Uncovered walkways, cracks in the pavement and steep ramps create little to major problems for wheelchair users and many other mobility impaired people. Until now extensive research was necessary to determine if a destination will be easily reached or if it was easier to just stay at home. 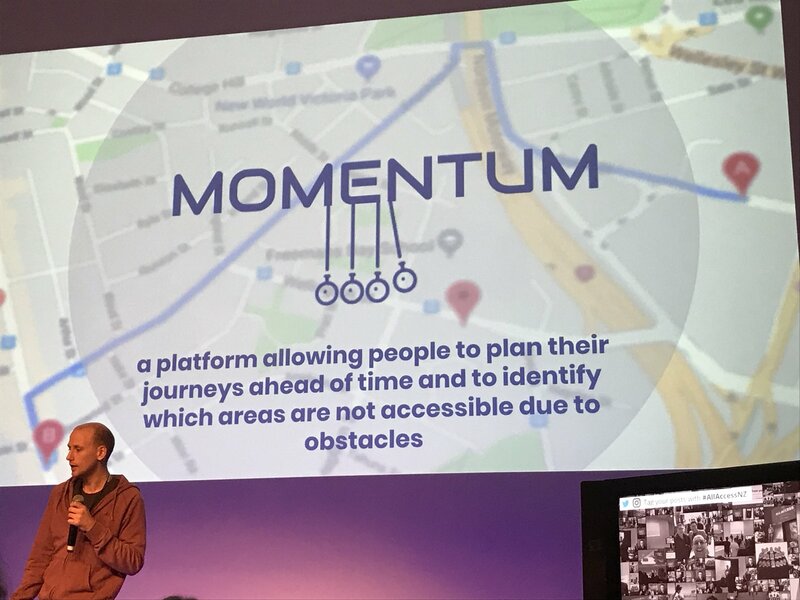 Momentum doesn’t only solve the problem of accessibility, it also gives back the independence that many other people enjoy every day without even thinking about it and enables people to participate in society like everybody else would. If only 10% of wheelchair users in New Zealand submitted two reports per week, the system could gather 5 million reports within a year. These reports can be used by other users to determine their ideal route to a target and by regional councils to prioritise work and allocate budget to make the environment more accessible for everybody. Initially all mobility impaired people could profit from a solution like this but in the long run the whole society might benefit from a more accessible, more inclusive environment! Early on on Friday I had a random thought that a map that displays accessible and inaccessible areas of a city would be cool. Pretty much something like wheelmap.org, just for New Zealand. A quick check with Gerri Pomeroy, the keynote speaker of the Hackathon and President of the Disabled Person’s Assembly, confirmed that something like this didn’t exist yet. I pitched my very vague idea in front of 120 people and hoped that at least one or two would find it interesting enough to dedicate their weekend to work on it. The competition was huge, from ride share apps over IoT based checks of car parks to a (probably unavoidable) blockchain solution for identity management. I ended up with a whole team of student developers who wanted to join me. It was great on one hand – because I instantly had a big team and I wouldn’t have a clue how to develop an app. On the other hand we were 8 or so techies, 7 of them students, 6 of those developers, all male. No matter from which perspective you are looking on that team, in order to make it work we needed some other skills. Luckily we found them in Amanda and Catherine who contributed urban planning and architecture, so we got some design skills and knowledge of the terrain we actually wanted to map. I was dedicated as the team lead (mostly because it was my idea) and we met Ashley, our mentor for the weekend. She was also the one person who told me what to do and how to approach things in order to stay within the time frame. We fleshed out the idea, realised that something like this already existed, pivoted slightly and settled on a system which reports accessibility problems on roads and sidewalks, ie. steep/missing ramps, cracked sidewalks, etc. Doors opened at 6.30, we agreed to meet at 8(ish). I still didn’t really know what my role as the “team leader” included. Everybody was there voluntarily and ended up in my team by chance. It didn’t feel like I was in a position to tell people what to do or what not to do. I quickly realised though that we were a group of people who are all very keen to do what they like to do. This doesn’t really work in such a setting where (nearly) nobody is able to produce a full blown product with all nice to have features. Instead we had to focus to get the basic functionality going. While the solution would have gamification elements at a later stage to keep users engaged, there was no point in developing an API at this stage, so this work had to go!…sorry for that! (Similarly, a leader board and user management where scratched early on as well). As an MVP, we needed Google Maps to mark a location, save it somewhere and be able to display it afterwards to another user. We actually ended up finding https://www.socialpinpoint.com/, a platform on which users can annotate maps and discuss these annotations – even better, it is already used by NZTA! With this sudden turn of events, our need for development suddenly disappeared, much to the frustration of our developers! We left a couple of people developing to see if they can create features we would like to demonstrate but were not available in socialpinpoint. The rest of us spend most of our time preparing the pitch on Sunday. Figuring out what to demonstrate, creating and testing presentations flows, mock ups of the UI and interactions. To be honest, I don’t really know how the day was suddenly over. The day started with pretty much everybody in my team criticising my slide deck! I am fully aware that I am lacking skills when it comes to creating this fuzzy, warm feeling in the audience. Most of my presentations are very factual or display an image of what I talk about and while my slides might benefit from being a bit more approachable, I struggle with finding a layout that isn’t just clutter. Anyway, my team felt stongly that my presentation needed to utilise a template of sorts, with me equally strongly feeling that it doesn’t! Luckily Ashley came to the rescue (as countless times throughout the weekend! Pretty much every time I seemed like I knew what I was doing, I was talking with her or one of the other mentors minutes before!). She reiterated the purpose of the pitch, to touch people and get their buy-in, and suggested to use large images and organise the little text on the slides around it. This was the same reasoning my team tried before but acknowledging that “just a template” wouldn’t cut it. In hindsight, I should have listened to them earlier but at the time I really felt that was the wrong direction! We worked on the presentation and demo, practised it countless times and changed things around until the last minute. At 1pm everything stopped and the pitches began! In the end, the winning idea was the one which supervised car parks for people with a disability in order to prevent everybody else from using them! Afterwards we ended up in a nearby pub to celebrate each other and our ideas! It was incredible to see how the insecurely proposed ideas from Friday took shape and turned into well thought through solutions which realistically could change the life’s of thousands of people! Many where close to the initial idea, some pivoted completely at some point and ended up with solutions which were nothing like the initial idea anymore. It was a great weekend with amazing people, interesting ideas and lots of good energy that kept everybody going for the whole time. I learned heaps of things, first and foremost about the accessibility of transportation across New Zealand. 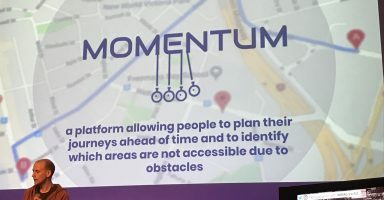 Through the research in our own team and everything the other teams presented there was a new light shed on the problems people face when trying to get from A to B. While the most obvious might be living with a disability, many people struggle because of the distance to the next transport hub or the money it takes to participate. The most interesting bits for me were the problems wheelchair users encounter on a daily basis which are just invisible for people who walk. The fact that even if there are accessibility ramps, they are often too steep for people to use them on their own and that the decline on sidewalks to drain rainwater makes it impossible to go straight in a wheelchair. Problems the majority of people don’t even think about and while lots of laws are in place to build accessible buildings, the path to these buildings is often forgotten. I also learned about fleshing out ideas, working in a team and organising work. While probably all of us do these three things in one way or another, it was very different to do it under the time pressure, with people I haven’t met before. To finish it off, I wrote down a few tips (most of them should be applied pretty universally and some of them are really just stating the obvious), for anybody to learn from and for me to read through again, when I register for the next NZTA Hackathon in March or so next year! It doesn’t matter what you do or know! Everybody can provide useful input, especially if you bring a different perspective. It doesn’t matter if you don’t know anybody! You’ll have a team instantly and latest then you will know a bunch of people. Embrace diversity! It’s great to hang out with your mates, but if all of you study the same and have the same hobbies, finding new ideas and challenging existing ones becomes difficult! Use your mentors! They will have a good idea of what’s required and can help you at every step. Every team needs a leader! It’s incredible how quickly discussions and work diverges when nobody keeps them on track. Accept feedback! If work streams are cancelled or you are told to change your presentation, try to understand the reasons! Have fun! It is a competition, but it didn’t feel like it until the pitches started. Do your best and enjoy working with others doing the same!